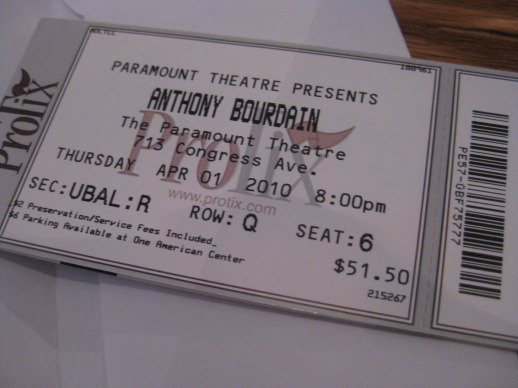 Last Thursday, Jamie and I had a fabulous date that included an evening with Anthony Bourdain. He came to the Paramount to chew the fat with us Austin folks. He had the audience in stitches with his foul-mouthed snarky quips. He likened Austin to an enlightened island of Texas. I think this seduced us. His favorite country is Italy, homeland of his wife. He tells us he wishes he were born Italian. His second favorite country currently is Vietnam. He made 5-10 shout outs for my parent’s native land. It tickled me that the 5-10 Vietnamese audience members will cheer every time he gave Vietnam a mention. He actually plans to move there for a year soon. He likened being a vegetarian and traveling to going to the Louvre and only seeing the paintings in blue. I lost count how many times he said MFer. He plans to come back to Austin in June to spotlight the wonderful trailer eats and food trucks we have. Food Travel Recommendation: Tokyo is an “acid trip” for a foodie. He promises you’ll come back changed and blown away and warns it can be traumatic, the culture shock. Food Travel Recommendation: Singapore he called “Asia Light.” Everyone speaks English and you can try cuisine from a slew of Asian countries just in their malls. Food Travel Recommendation: Spain. Food. Good. Food Travel Recommendation: Never eat at the foreign hotels. The locals of a foreign country working at the hotels are making their version of “Western” foods which with they are not familiar. Secondly, they are not invested in your health as they expect you to fly back to your part of the world by the time you catch on you’ve just been accidentally poisoned. Your best bet to warding off food sickness is to eat the local food. Anthony Bourdain spends little time in Scandinavia. He says he prefers his country dirtier and a little disordered and they’re a bit too clean and orderly for him. 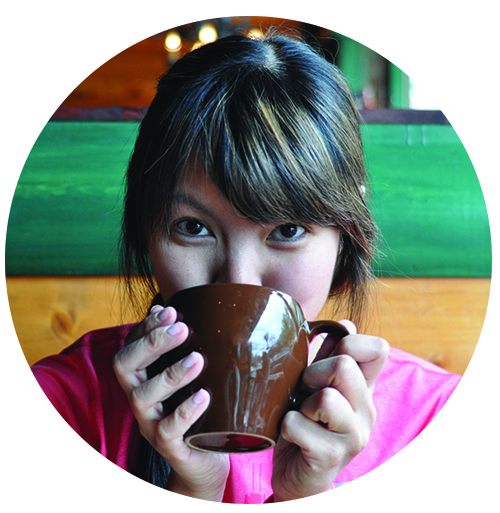 Food Travel Recommendation: Be polite. If you are offered steamed puppy heads, eat the steamed puppy heads. “F- your principles” is a direct quotation. Food Travel Recommendation: Hong Kong. That concludes my bulleted recap. I have now added Anthony Bourdain’s books to my long reading list. Cannot wait to devour more of his words. Question:Anthony Bourdain is not for everyone. Are you a fan?